Conversations about the importance of diversity in children’s literature have been gaining traction over the past decade. The grassroots campaign, We Need Diverse Books, brought the topic into mainstream conversations using social media to build a movement for more inclusive and representational kids books. In 2015, 11-year-old Marley Diaz became a poster child for the diverse books movement when she set out to collect and donate 1,000 books featuring a black female protagonist. Marley’s #1000BlackGirlBooks campaign put a big spotlight on a major problem that was going largely unchecked. Students of color were (and continue to be) marginalized and underrepresented in children’s literature, while their white peers gain an inflated self-image. The truth is, all students stand to benefit from reading stories of diverse characters from different backgrounds. Now, the dialogue of representation is shifting to further examine who is telling these diverse stories. As authors and illustrators of color strive to break through the industry in larger numbers, the #OwnVoices movement calls for authors sharing stories of their lived experiences. #OwnVoices is about opening the door to let marginalized groups tell their stories. It’s about children seeing themselves in the stories and knowing that behind that story is a person like them. While the number of diverse books has been on the rise in recent years—from 20 percent in 2015 to 31 percent in 2017—the number written by diverse authors remains dismal. 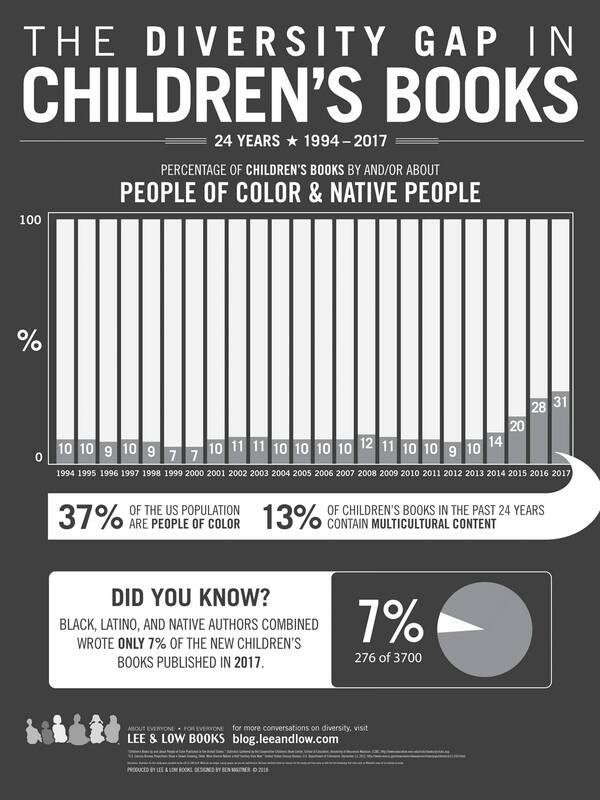 Lee and Low Books reports that only 7 percent of the new children’s books published in 2017 were written by Black, Latinx, and Native authors combined. Further, only a small percentage of books featuring diverse characters are written by authors with a shared identity. For example, only 29 percent of the 340 books published about African/African American characters in 2017 were written by black authors or illustrators. Similarly, only 34 percent of books about Latinx characters were created by #OwnVoice Latinx authors. In fact, while the number of books featuring Latinx characters has been on a steady rise, the percentage of those books written by Latinx authors and illustrators has gone down from 61 percent in 2016 to 34 percent in 2017. More people are writing about Latinx characters, yet a smaller proportion of books published feature Latinx voices. Not only do diverse authors deserve to have a fair shot at getting their books published, but there are inherent benefits to #OwnVoices books. When diverse authors write from an #OwnVoice perspective they are able to portray the subtle nuances of an identity that other authors might miss or misinterpret. Kayla Whaley describes such nuance through her experience as a wheelchair user. I’m intimately familiar with enduring and combating ableism, navigating an inaccessible world, exploring disabled identity, and embracing disability pride. I know not only which tropes to avoid, but how much those tropes hurt — because I’ve been hurt by them before. As the pursuit for diverse, representational, inclusive children’s books continues, let’s remember to prioritize representation in the author’s voice, as well as on the cover. To help get started, we’ve compiled a list of 12 great #OwnVoices children’s books. 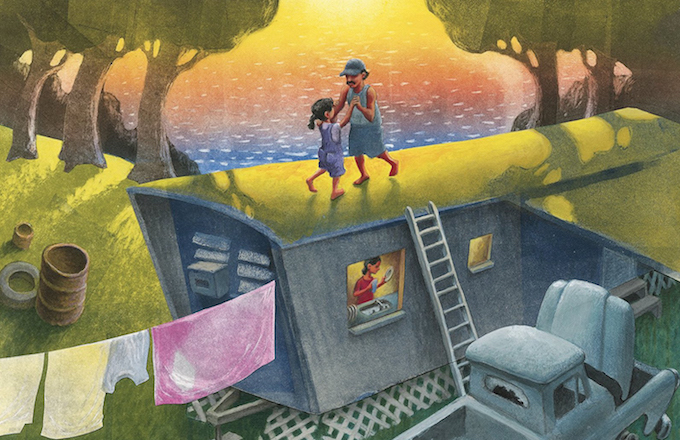 Here are 12 #OwnVoices children’s books written by authors with diverse perspectives and stories to tell about the world—all through the lens of lived experiences. Share your favorite #OwnVoices authors and kid’s books with us by using the #OwnVoices hashtag and tagging @ReadingPartners on Facebook, Instagram, and Twitter.